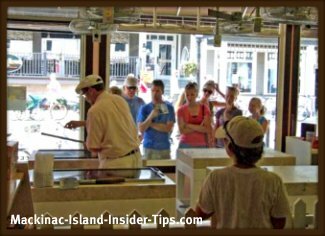 Mackinac Island Shopping:clothing, galleries, souvenirs, and quality gifts. 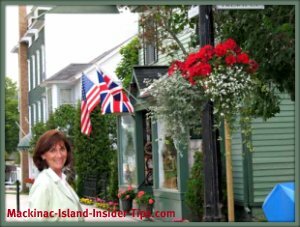 Mackinac Island shopping is a unique experience. There are a variety of one-of-a-kind specialty shops and boutiques that are sure to spike your interest. Most of the shops are on Main Street which is quite busy with all the ferry boats and big hotels on that street. Market Street is one street off Main Street and has some nice gift shops. Fort Mackinac has a wonderful gift shop that you should not miss if you buy tickets to visit the fort. It's definitely worth a visit! Where the Lilac Tree Hotel and Spa front door is there are a few shops tucked in this hidden alcove. In fact, one of our favorite shops is located right next to the Lilac Tree's front door which is the Island Bookstore where you can sit down and relax with a few books to enjoy. It's a dog friendly shop so Fido is more than welcome too. Shops intermixed with restaurants and fudge stores line Main Street. 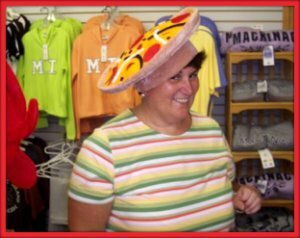 You can have fun choosing the perfect crazy souvenir hat! And of course, there is a wide selection of sweatshirts and T-shirts. Browse for unique jewelry pieces, clothing, toys, kites, books, and even original art work. Scrimshanders has beautiful scrimshaw items. There is even Professor Harry’s Old Time Photos, the perfect place to capture a photo of your group in period costumes. 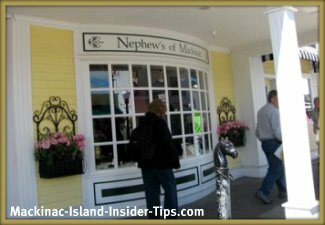 For the ultimate keepsake, stop in to visit Murray's Mackinac Island Realty and check out the real-estate listings! 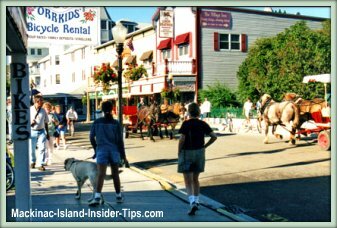 You would not be the first one to decide to make Mackinac Island a permanent residence! Resort hotels have gift shops as does Surry Hill, which is at a stop on the carriage tour route. All of the Butterfly Shops have a wide selection of gift items. 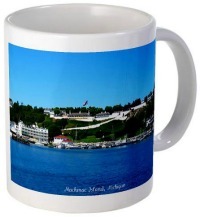 There are endless places to pick up the perfect Mackinac Island keepsake. If you are a golfer, be sure to check out the Pro Shop at Wawashkamo Golf Club. This beautiful club is located in the center area of the Island and is a great find for golf enthusiasts. You will have to take a horse-drawn carriage, ride a bike, or walk to get there, but it is well worth it! There is also a great Pro Shop at the Grand Hotel's Jewel Golf Course.